Although not being one of the newest to enter the world of exclusive perfumes collections Bvlgari Le Gemme is it's somehow little-known - i don't know if it's due a more selective distribution, by a saturation that is growing in this market or even Bvlgari more mainstream positioning ofuscating its exclusivity factor. I was curious tough by the 6 first creations, each inspired by a different gemstone and color. And the choice of the perfumer certainly looked promising: Daniela Andrier has done a work of great elegance for designers like Prada and Margiela. In trying the first two fragrances of the saga that will involve the six creations, the first impression I have is that there was a kind of fusion between the commercial Bvlgari perfume style with the one Daniela Andrier has developed for other brands. 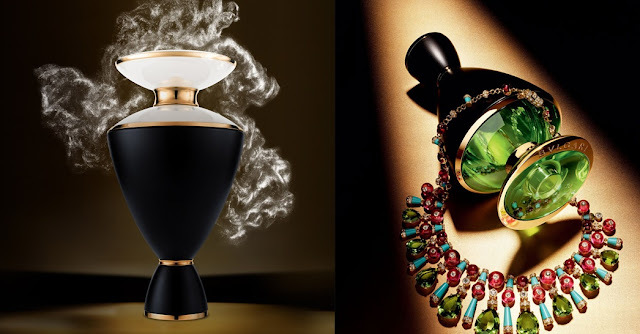 Both Calaluna as Lilaia seem clearly connected with the colors of precious stones that claim to honor, but at the same time there is a certain familiarity with other creations made by perfumer that leaves me divided in this first moment between a critic and a compliment. Let begin by Calaluna, the creation of the collection that fills in this first moment my perception of the most commercial slot in this collection with a creation that finds a way to fit a white themed in ano obvious way. Inspired by the moon stone, a precious stone of a white or transparent color, the proposal of the perfume is to emulate the feeling of comfort, protection and well-being that is associated with it. For this, the perfumer seems to do a mix of two of its delicate perfumes made for prada: CalaLuna is in parts of the silky and velvet iris of infusion and parts the luxury baby soap aroma of prada amber pour homme. What's new here is perhaps a reinforcing milk and sandalwood accord and somehow a brief homage to the white tea scent of the brand. The result seems a little simple, too delicate and the nuances that resemble commercial creations end up highlighting more than what is added of new here. Lilaia, however, can fit less obviously and more interesting another idea crafted by Andrier in a creation that also worked with Galbanum in a important way. This inspiration goes back to ancient times to homage a stone appreciated by Egyptians Pharaohs, the Peridote, while the name is a reference to a Greek deity associated with spring. The theme revolves around the green and exotic, but exotic worked in the more minimalist jewelry aesthetics, which fits in the olfactory signature ofAndrier. To Lilaia she brings her galbanum and musks accord used in Margiela Untittled and gives it an a little refreshing, cooling and slightly resinous air with the combination of mint and lentiques. What gives me a distinct aura in this fragrance and curiously is not highlighted is a floral accord that clearly refers to jade flow, a type of tea made with infusion of jasmine petals in green tea leaves. At first you can give the impression that the green tea accord alludes to the first perfume brand, but there is a greener look and slightly smokiness typical of green tea and that is not present in the creation of Jean Claude Ellena. Finally, you can see a clever use mate tea clever functioning as abase note and emulating alternatively a patchouli aroma. As much as there are familiar aspects, Lilaia seems richer and better worked and is successful in balancing a transparent aura and a consistent performance of an EDP concentration.